The beachside resort of Terrigal is busy. It’s a balmy winter’s day and the traffic is crawling aa snail’s pace and the cafes and the Crown Plaza Terrigal are bursting with people. Stroll along the beach under Norfolk Pines or do nothing and absorb the resort ambience. Considering the plethora of eateries I only find Vanilla On Church selling scones, so I pull up a chair outdoors in the disappearing sun and nab the last two scones. The first thing I notice when my Devonshire Tea arrives is the cream. I’m not sure whether I should be shocked, appalled or just puzzled by the puddle of liquid cream, as it is the runniest cream I have ever been served with my scones. Imagine the other end of the spectrum to clotted cream, that’s what I have. I’m too stunned to take the cream back and ask whether it was a mistake as perhaps they are too lazy to whip the cream that’s obviously been poured straight out of the container. But maybe the dish has come straight out of the piping hot dishwasher and the double thick cream has melted? I’ll never know, but all I can say is – weird. The jam looks synthetic, and alongside the cream, there’s not enough to go around. 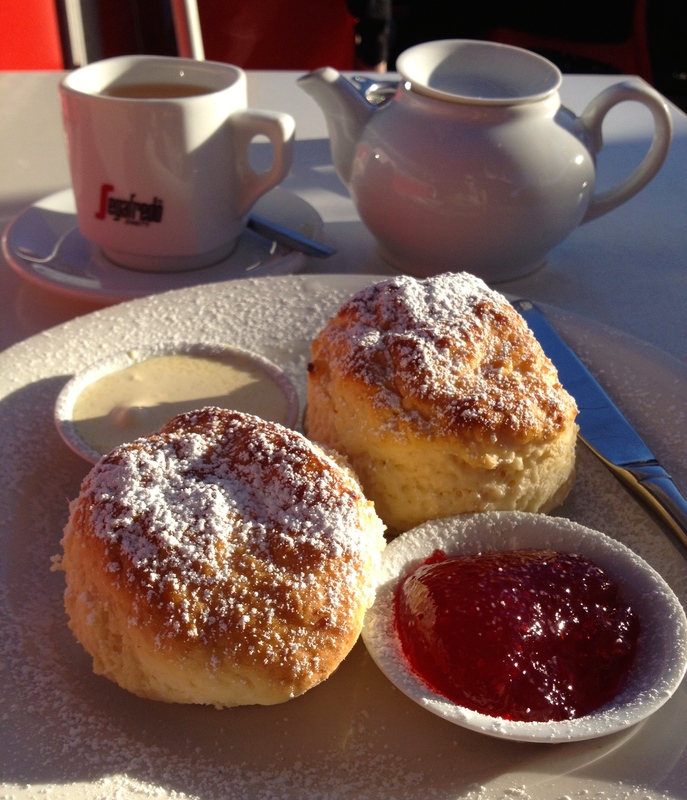 The best part of the ensemble without a doubt are the scones: crispy on the outside and soft and fluffy on the inside. Maybe the cream is a one-off and you have better luck if you visit. Tea: A variety of Q Tea loose-leaf teas served in a small pot. Overall: Although a block from the beach, it’s still a nice sunny corner to while away some time. Sage Cafe sits in the fresh air on the outdoor, or atrium level of the Erina Fair Shopping Centre. It’s a winning choice on a winter’s day, especially to catch some winter sun and even the feeling that you’re in a shopping mall. I’m here on a recommendation so I am expecting good things, and it doesn’t disappoint. The large airy cafe has a variety of seating: inside, on the enclosed verandah and outside at the entrance. Service is swift, although ordering at the counter can get tedious if it’s busy and the cashier isn’t up to speed with the ins and outs of the ordering and payment process. My citron scones arrive looking delectably crisp and are soft and fluffy on the inside. I am blown away by the jams – two house made flavours. The only problem is, I can’t get a straight answer from the two wait staff I ask. The first comes back with blackberry and peach and strawberry, which I know for a fact neither is a match. And the second answer comes back as mixed berry and ‘I don’t know there wasn’t a label on the container.’ I’ll go with the mixed berry, and the second have a distinct marmalade flavour, although it could had been where the peach comes in. All I can say that scones taste better with good quality jam. The whipped fresh cream is acceptable but light. 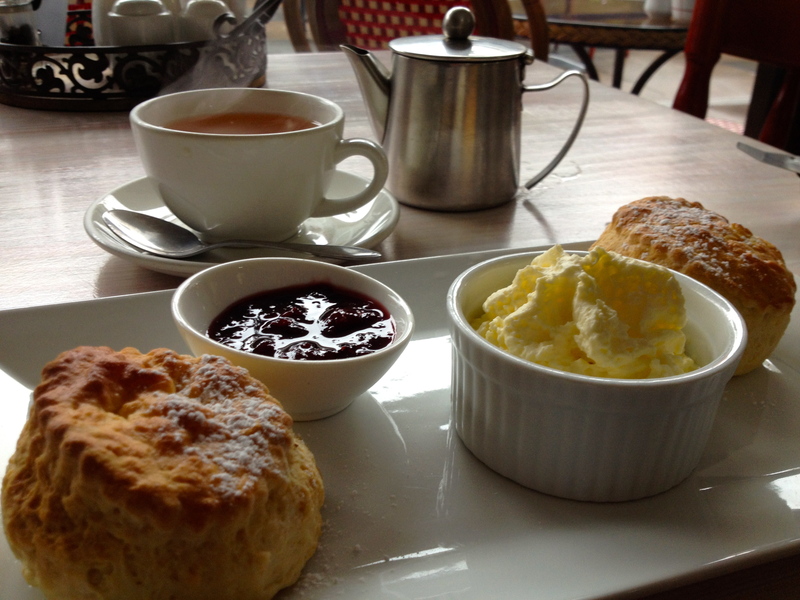 With high marks for two out of three factors, it’s a Devonshire Tea success! Tea: 20 T2 loose-leaf teas served in a small pot. Overall: Superb, I just wish someone on staff had an idea about what the jam flavours were. You won’t find me hanging out in a mall in my spare time, but you never know. 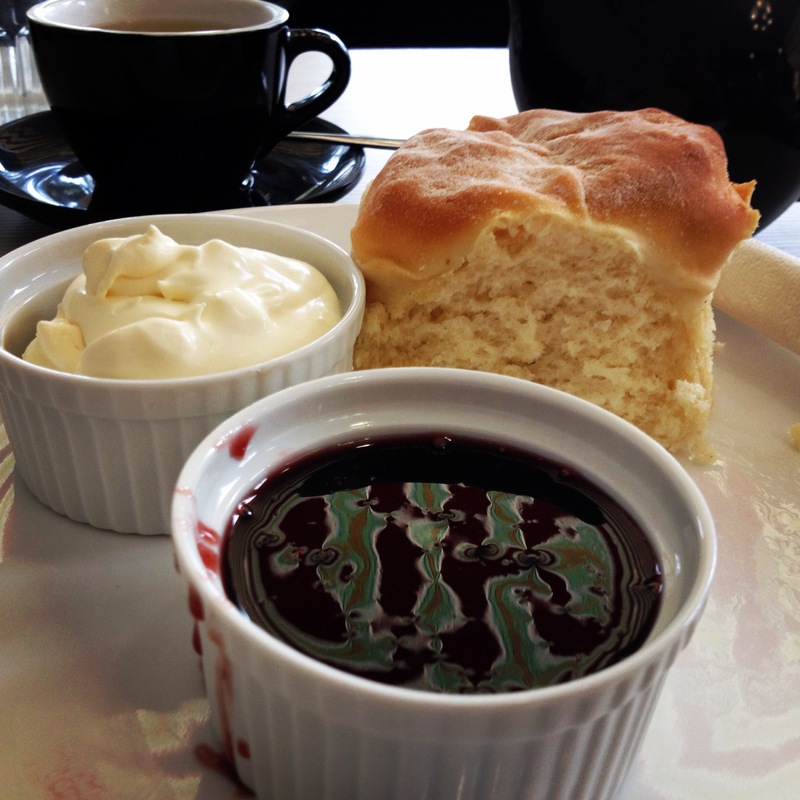 The Silver Tree Cafe at Erina Fair Shopping Centre is a no-nonsense place to take a break from the maze of shops. Slip in to one of the booths towards the back of the cafe for some quiet or pull up a pew that looks out towards the mall to people watch. The homemade scones are pretty good, crispy on the outside and soft on the inside and I’ve got to say I’m happily surprised. However, the jam is average and the whipped cream is quite light. The T2 tea is a bonus but what’s with the teeny tiny pot? Tea: 9 choices of T2 loose-leaf teas served in a tiny pot. Tea: 45 varieties of loose-leaf teas on offer. Overall: A contemporary tea house vibe. To be honest, I’m not too keen on the ‘Bakehouse On Wentworth’ outlets in the Blue Mountains. Maybe it’s because I’m not an avid meat pie eater. 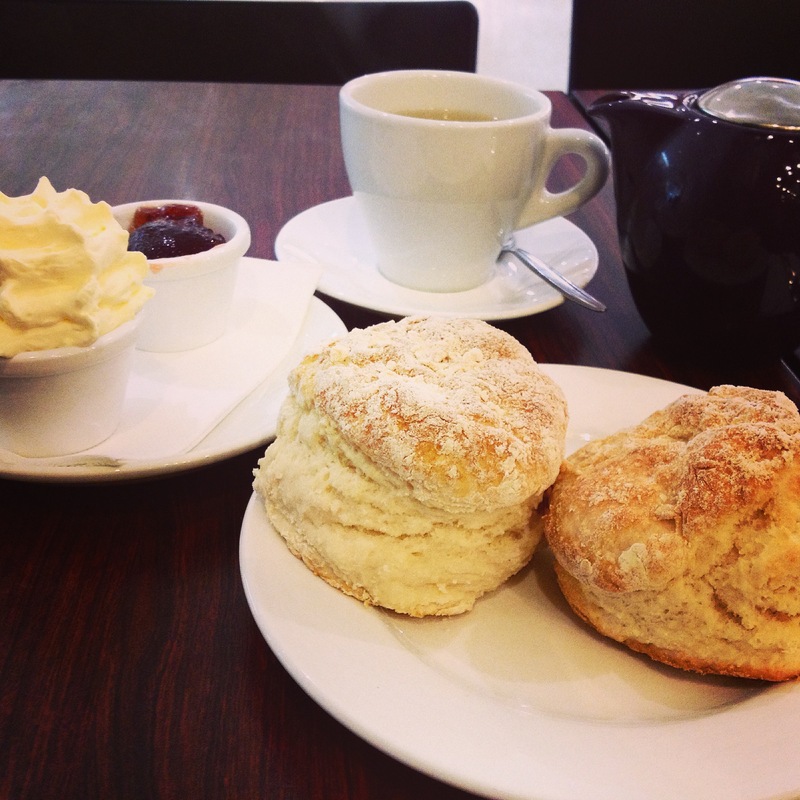 When I tried the Devonshire Tea at their Blackheath store, it was pretty dismal and after buying some pricey yet underwhelming cakes there a few weeks back, I just failed to see the attraction. However, I reasoned with myself to be open-minded, it is a guide after all for all sorts of tastes, expectations and desires. So after I settle in at the sunny bar that runs along the window at the Bakehouse On Park in Glenbrook, and my well-priced Devonshire Tea arrives, I am unexpectedly surprised. The scones look good and break apart nicely. They have a lovely texture and taste but are let down by the ordinary jam, that needs to be doubled in quantity (the scones are big), and the very lightly whipped cream. Overall, it’s a huge improvement on the Blackheath spread and maybe I’ll try the one in Leura and Springwood next. Tea: A small selection of Lipton teabags served in a small pot. Overall: The sunny possie in winter is a prime spot on Park Street. A cafe with a difference, The Little Paris Cafe injects some colour into the usual cafe scene on offer in Katoomba. Compared to the Coffee Shot who occupied the digs previously, this cafe is an inviting splash of colour in the drab concrete clad plaza. Bright, warm and inviting the cake cabinet is laden with good quality goodies and I can’t keep my eyes off the caramel tarts. The menu of course is French; croissants, croque monsieur, you get the picture. Surprisingly then is to see scones on the menu. These are fresh from the oven, crispy on the outside and warm and fluffy on the inside. The jam is quite tart, but I like it as it softens the sweetness of the Chantilly cream, which as you know, is a bit light for me. I don’t like having puddles of liquid on my scones and jam. The Princess Pantry jam, La vie en Rose, is a mix of strawberries, raspberries and rose water and is made in nearby Leura. It’s delightful, but quite tart for those with a sweet tooth. 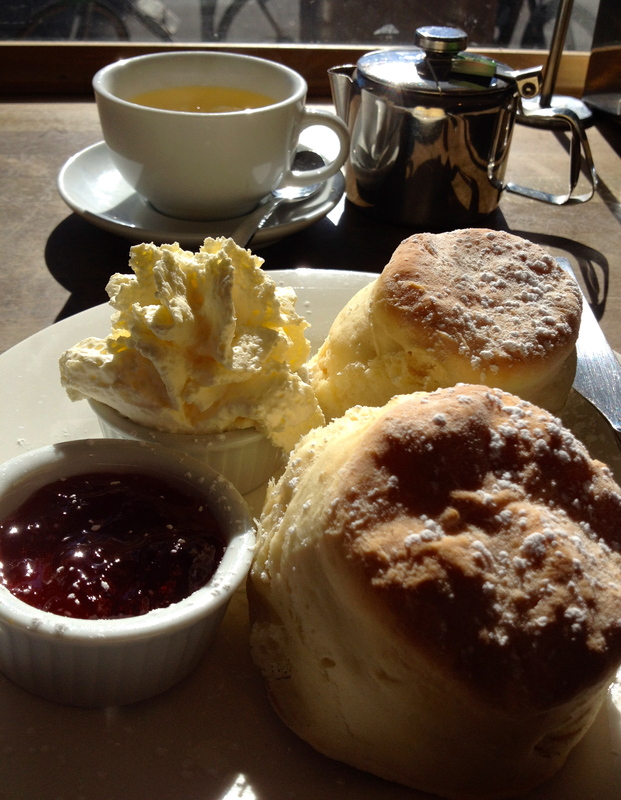 Shame about the short trading hours – 8.30am to 2.30pm, as the scone-witching hour is definitely in the afternoon for me. Note at the time of visiting the cafe was closed on Sundays, but the owner says she is looking to change that. 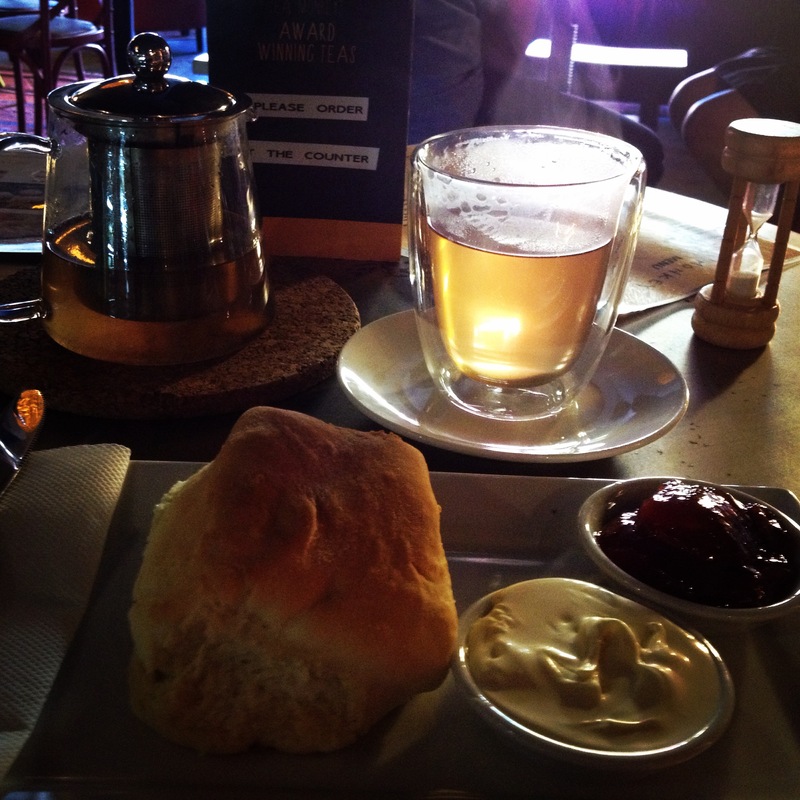 Tea: A mish mash of loose-leaf teas served in a too small pot. Overall: A tiny slice of Paris. The only reason I had heard of The Cafe Sienna in Annandale is because of the High Tea deal I saw on one of the cheap coupon websites. When I called to ask whether I could order scones on their own, I couldn’t quite get my message across so I decided to just pop in. Located on a quiet leafy street corner in lovely Annandale, the beautifully restored corner store with sky-high ceilings and large picture windows is a pleasant place to hang out in or outside. I slide in next to a table that is reserved and set for high tea with a dainty tea cup and saucer, which causes me great disappointment when I end up with a thick rimmed coffee cup instead. It’s not just me that has been duped; the lady outside gets the same cup with her pot of T2 tea. Although I ask at the counter about the scones, a menu is still shoved into my hand even though there are no scones listed. 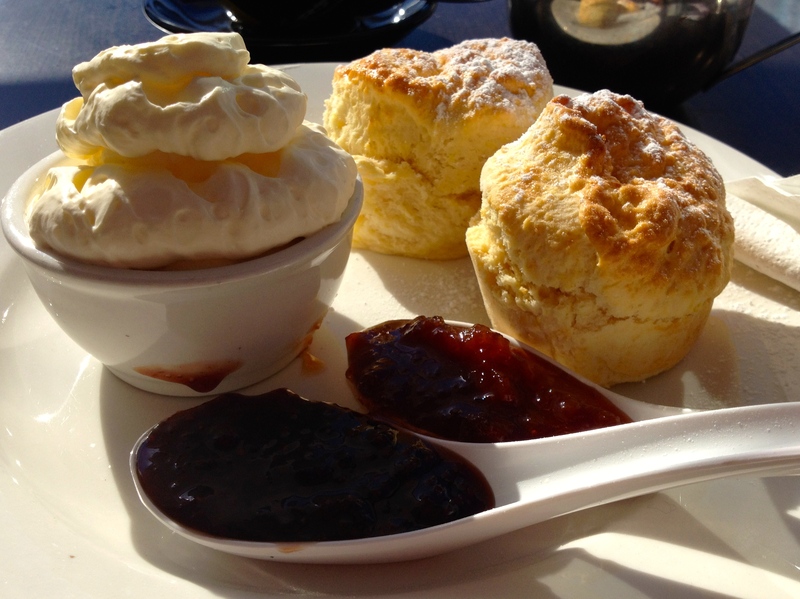 I tell the waitress what I want, and guessing its part of a high tea wrongly assume the scones will be bite size. Instead my two scones arrive the size of dinner rolls, so I send one back. The bread roll looking scone is steaming hot (from the microwave) with a dry top. They are neither ravingly good nor scathingly bad, just average, which is a real shame as the chilled thickly whipped cream is sensational. The cherry jam is plentiful and different but it is mostly sickly sweet syrup than rich fruit. A place to linger with free WiFi on offer. Tea: 18 choices of T2 loose-leaf teas served in a good-sized teapot. Overall: A sneaky cafe tucked away in the mellow Annandale streets.